However hard they tried, however much help they had from Wirral Council’s Director of Adult Social Services Graham Hodkinson and Cabinet Member Cllr Chris Jones Wirral CCG found themselves unable to move forward in the paddle wheel of Wirral Council politics. The next bit however you will find hard to believe but then the whole topic became complex. The five Conservative councillors (who are the opposition) on the Adult Care and Health Overview and Scrutiny Committee led by spokesperson Cllr Wendy Clements (who felt insulted at the suggestion that councillors could be misled), voted that they upheld the decision of Labour councillors on the Joint Strategic Commissioning Board (a Cabinet Committee) to pool budgets with the Wirral CCG. Cllr Wendy Clements rejected the suggestion that councillors could be misled. The Labour councillors and sole Liberal Democrat councillor (a total of ten) however changed the decision. It will now not be implemented, but will be referred to a meeting to which all Wirral Council councillors will be invited to decide what to do next. 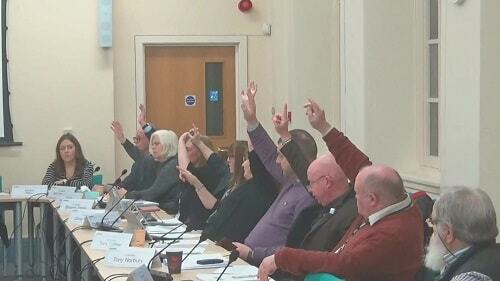 Despite Wirral Council managing to hold numerous joint committee meetings between itself and the Wirral CCG, councillors on the Children and Families Overview and Scrutiny Committee present last night expressed their concern at being again denied any vote at the meeting on the issue of pooling budgets involving services for children and families. On this website http://www.dresselstyn.com/site/buy-cialis-ed-pills-online/ learn where to purchase Cialis (Tadalafil) online. Cllr Tony Norbury also raised the issue of the Walk-In Centres, despite councillors recommending that the Wirral CCG consultation on that matter cease the Wirral CCG had decided to carry on with the consultation. « Why are people trying to silence doctors on the subject of patient safety? We need to get rid of the lot of them! Thanks for your comment keef666.